Perhaps “Winter is here” for House Stark, and is spreading around the Seven Kingdoms, but out here in the real world, summer is in full swing! And it’s not ending any time soon for those lucky ones who live in warm climates! And since you can never have too many swim trunks, it’s not too late to upgrade your beachwear. 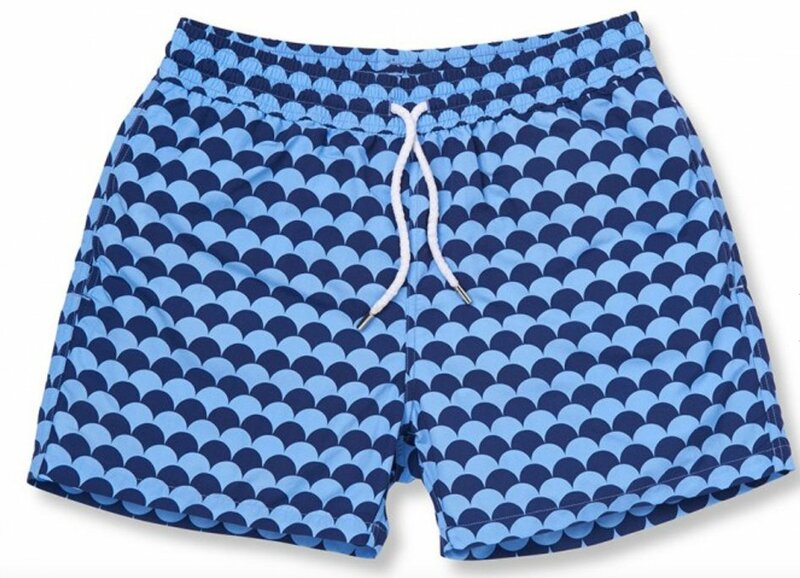 From classic solid colors to patterns and prints, here’s our pick of swim trunks that reflect sea and sky. Let’s make you, once again, the “coolest” man in the heat. The concept behind Orlebar Brown is effortless style; beachgoers wouldn’t need to change their outfit between a dip in the ocean and lunch by the beach. Unlike saggy swim trunks or long shorts, these shorts’ cut fits very well under a pair of pants. The Bulldog Hayman Island shorts show a lovely picture of Hayman Island, nestled at the northernmost point of Australia’s Whitsunday archipelago, in the heart of the spectacular Great Barrier Reef. We love how the shorts look like a painting! Frescobol Carioca: a swimwear craft, a pattern guru, The Rio de Janeiro-based brand -yes, from Brazil, where swimwear is as important as bread and water!- perfected the art of retro graphic patterns, flashy or toned down, on modern swim silhouettes. These ‘Noronha’ swim shorts are inspired by the idyllic landscape of Noronha, on the north-eastern Brazilian coast. The sky blue and navy hues make the design pop up even more. These White Shark Quick Dry Swim Shorts Boss shorts feature a signature, embroidered pattern for spring/summer 2017 in a quick dry fabrication, for more practicality whether at the beach or by a pool. Also available in white with navy fish patterns. Although we’re not crazy about the length of the “White Shark”, we like the cute fishies. Hey, at least they don’t bite! 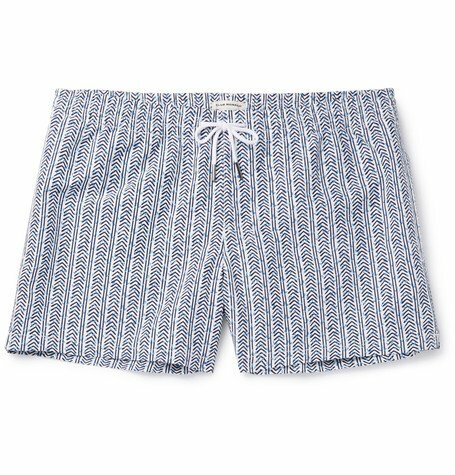 The slim-fitting ‘Arlen‘ swim shorts by Club Monaco are cut from quick-drying shell printed with an abstract waterfall pattern in holiday-ready shades of white and tonal-blue. Use the drawstring ties to customize the fit of the waistband – erring on the secure side to ensure they’re not loosened by diving or particularly boisterous waves. 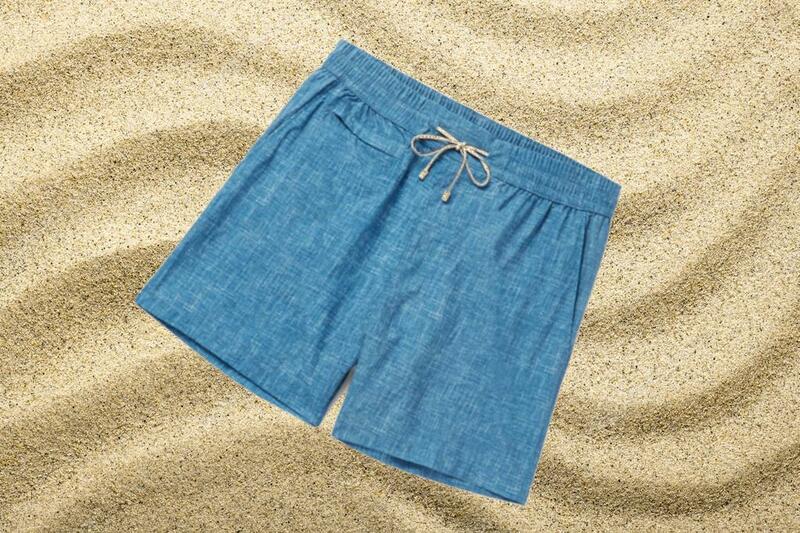 Loro Piana’s swim shorts are made in Italy from quick-drying shell. Printed with a hazy blue and white pattern resembling chambray fabric, they look and feel light. The mono color keeps the design simple and uncluttered. They’re fitted with several practical pockets and supportive mesh briefs. Paired with a plain white tee, they’d also make for a nice outfit when out sailing. 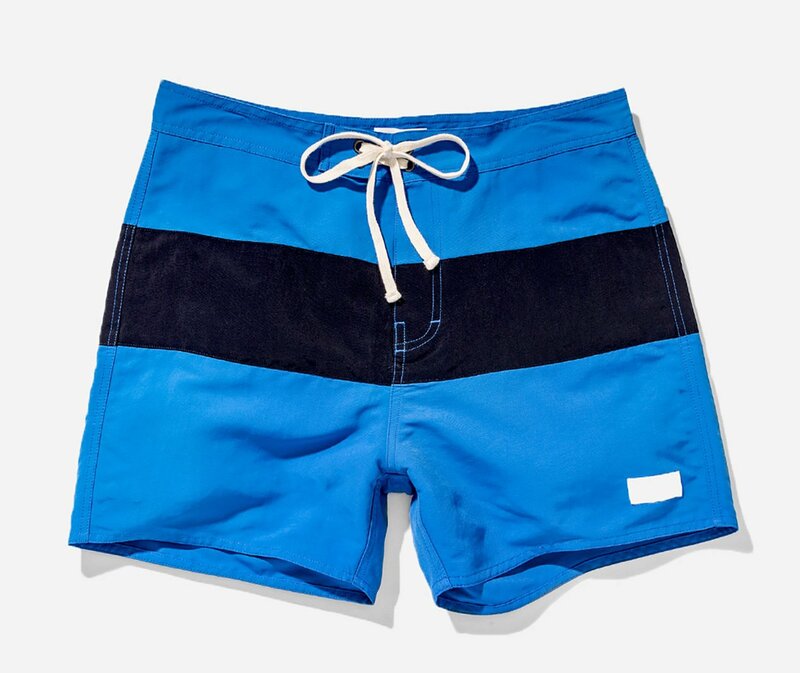 Another dual blue piece, the Grant Boardshorts in Bright Blue and Midnight (color names given by the brand) are designed as a two layer color block construction. The Bright Blue hue is fresh and summery, constructing nicely with the dark navy tone of the thinner strip. Now take that shirt off, put your sunglasses aside, and take a dip. Do not forget your sunscreen though! Cover image courtesy of Orlebar Brown.